Michael Keaton, Mark Ruffalo, and Rachel McAdams lead a critically acclaimed cast in this gripping true story about the Pulitzer Prize-winning investigation that uncovered a scandal that rocked one of the world's oldest and most trusted institutions. Delving into allegations of child abuse within the local Catholic Archdiocese, a tenacious team of Boston Globe reporters exposes a decades-long cover-up that reaches the highest levels of Boston's religious, legal, and government establishment. "Brilliantly acted and flawlessly directed" (New York Post ) Spotlight is a powerful and riveting drama the critics are calling "the All the President's Men of our time" (Los Angeles Times ). There's not a lot of flash to 'Spotlight'. Not a lot of attention to lush cinematography or to overblown dramatics. Instead, Director Tom McCarthy takes a rather remarkable screenplay (which he co-wrote with Josh Singer) and just lets his actors act. And they act the hell out of this baby. It's up for debate whether 'Spotlight' is the best movie audiences were treated to in 2015, but there's little question that no film had as many good performances in it. There's not a bad turn here from anyone, even McCarthy's supporting cast. The movie tells the real-life story of the Boston Globe reporters who uncovered the vast sexual abuse committed by Catholic priests on young parishioners. The 'Spotlight' of the title refers to the investigative team of journalists at the Globe, whose job it was to find out about and report on stories that either no one else was covering or – much like this case – no one else could find out about because the cover-up was so large. This is the kind of topic that one would expect to see in a made-for-cable film and/or something that wouldn't necessarily result in a highly engaging movie. But the screenplay and actors here are so strong, you can't take your eyes off the screen. 'Spotlight' may not be a thrill ride, but it's certainly a white-knuckle one. The story begins as Marty Baron (Liev Schreiber) arrives on the scene as the new editor of the newspaper. In one of his first actions, he wants the Spotlight team – led by Robby Robinson (Michael Keaton) – to further investigate a story the paper did about a priest's sexual abuse of a child. At first, of course, no one is talking. But once the team – which includes Michael Rezendes (Mark Ruffalo) and Sacha Pfeiffer (Rachel McAdams) – starts getting people to open up, they start to learn that the abuse involves far more than one priest and a huge institutional cover-up by the Catholic Church. As I've already noted, all of the actors are quite good here in their parts – and I particularly enjoyed Schreiber, who chooses to make his Marty Baron calm, cool, and collective rather than angry and outraged. However, speaking of angry and outraged, no actor does a better job here than Mark Ruffalo, whose Rezendes shows the kind of frustration that you might expect when he can't get his bosses to run with the story when he wants them to, followed with the kind of passion you'd hope for when he finally gets the chance to obtain some much-needed evidence that will blow the lid off the scandal. 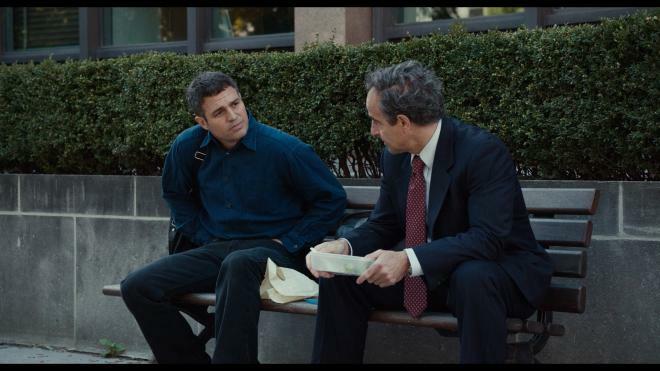 Ruffalo's been nominated for a Best Supporting Actor Oscar for his performance here, and it's well deserved. 'Spotlight' has been compared favorably to All the President's Men in the way it shows investigative journalism in action, and it's a good comparison. What I liked most about 'Spotlight' is that it never gets mired down in subplots. In fact, viewers learn very little about what any of the characters in the movie do outside of their work lives. That's to the film's advantage, as it keeps its storyline focused throughout. While 'Spotlight' is a great dramatization of how the Boston Globe uncovered the depth of sexual abuse in the Catholic Church, at its heart it's really a movie about old-fashioned journalism, and all the integrity that comes with it – something that is slowly vanishing in our modern society, where news has become more about money and ratings than it is about the truth. So even though it tackles a dark subject, there's inspiration to be found here and it's for that reason that 'Spotlight' is highly recommended on home video. 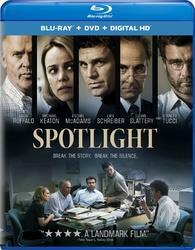 'Spotlight' shines on home video in this Blu-ray/DVD/Digital HD combo pack from Universal. The discs are housed inside a standard Elite keepcase, with an insert containing a code for both an iTunes and UltraViolet digital copy of the movie. A slipcover matching the artwork of the keepcase slides overtop. Both the dual-layer DVD and the 50GB Blu-ray are front-loaded with short trailers (about 30 seconds each) for Steve Jobs, 'Race', Suffragette, Trumbo, The Danish Girl (this one clocks in at about a minute), and Straight Outta Compton. The main menu is the standard Universal design, with a still of the actors in the movie (gathered at a desk, but slightly different than the photo on the box cover) and menu selections vertically down the left side of the screen. 'Spotlight' was shot digitally on the Arri Alexa XT and is presented here in its original aspect ratio of 1.85:1. There's a noticeable difference here between scenes that are shot inside the Boston Globe's offices and those that are shot elsewhere. The offices have a very white and sterile tone to them, which also allows a little noise to creep in from time to time given the almost exclusively all-white backgrounds. On the other hand, when the movie ventures outside and to other locales, there's a much more lush and colorful look. Regardless of location, each shot is full of the kind of depth and detail one expects on a 1080p transfer of a digitally shot movie. Black levels are solid here, and I didn't notice any issues with aliasing or banding. A well-done, if not reference-quality, transfer. The only available audio track here is a 5.1 English DTS-HD Master Audio one that, as one can probably guess, provides more than an adequate aural experience for a movie that is primarily focused on dialogue. While the dialogue is almost exclusively up front, the rears are used quite a bit for ambient noises, such as for the busy routine of a newspaper office, the sounds of background occupants of a public gathering, or just the normal noises of a busy street in Boston. Through it all, each bit of audio has a separate and distinct rendering, and there are no evident issues with muddiness, dropouts or the like. While not a track that is going to show off one's audio set up, it's one that certainly is solid throughout. Subtitles are available in English SDH, Spanish, and French. Uncovering the Truth: A Spotlight Team Roundtable (HD, 6 ½ min.) – This is a great (and all-too-short) featurette where the real-life reporters tell their story of the investigation. Included here are comments from Former Boston Globe Editor Marty Baron, Former Spotlight Team Editor Walter 'Robby' Robinson, Former Boston Globe Deputy Managing Editor Ben Bradlee, Jr., Boston Globe Reporters Mike Rezendes and Sacha Pfeiffer, and Former Boston Globe Reporter Matt Carroll. 'Spotlight': A Look Inside (HD, 2 ½ min.) – This is a more typical promotional piece for the movie, which features 'talking head' comments from Director/Co-Writer Tom McCarthy and actors Michael Keaton, Mark Ruffalo, Rachel McAdams, John Slattery, Liev Schreiber, and Stanley Tucci. The State of Journalism (HD, 3 min.) – The actors talk about the current state of investigative journalism, and how there are fewer and fewer reporters who do this type of work anymore. Included here are comments from Director/Co-Writer Tom McCarthy and actors Michael Keaton, Liev Schreiber, Mark Ruffalo, Brian d'Arcy James, and John Slattery . 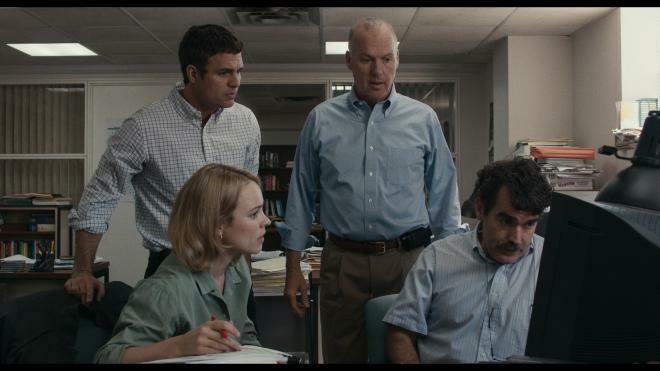 One wouldn't think a movie about reporters investigating sexual abuse within the Catholic Church would be all that engaging, but the acting in 'Spotlight' (as well as a fantastic screenplay) is so top-notch, the movie is riveting and holds up to multiple viewings. If you're the kind of viewer who loves to sit back and watch actors do great work, you'll want to add this one to your permanent collection. Highly Recommended.